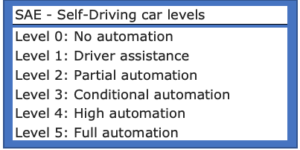 Level 5 is full automation, which allows self-driving cars to operate with no human assistance. Google and Uber, among others, are aiming to develop level 5 cars, but many consider this to be a moonshot. But from level 0 (no automation) to level 4 (high automation), human assistance is a must; artificial intelligence capabilities, mostly based on deep neural networks, augment the human driver’s capabilities. The level of human assistance required diminishes as the levels of automation increase. Audi, BMW, NVIDIA, Tesla, Volvo, and many others are aiming at levels 0 to 4, and today they are mostly deploying self-driving capabilities in cars at level 2 or slightly higher, so there is still a ways to go. This framework has another interesting characteristic, one that is common to the Richter scale for earthquakes: Moving from one level to the next follows an exponential function curve. A magnitude 6 earthquake is much more destructive than a magnitud e 5 — and many times more destructive than a magnitude 4. 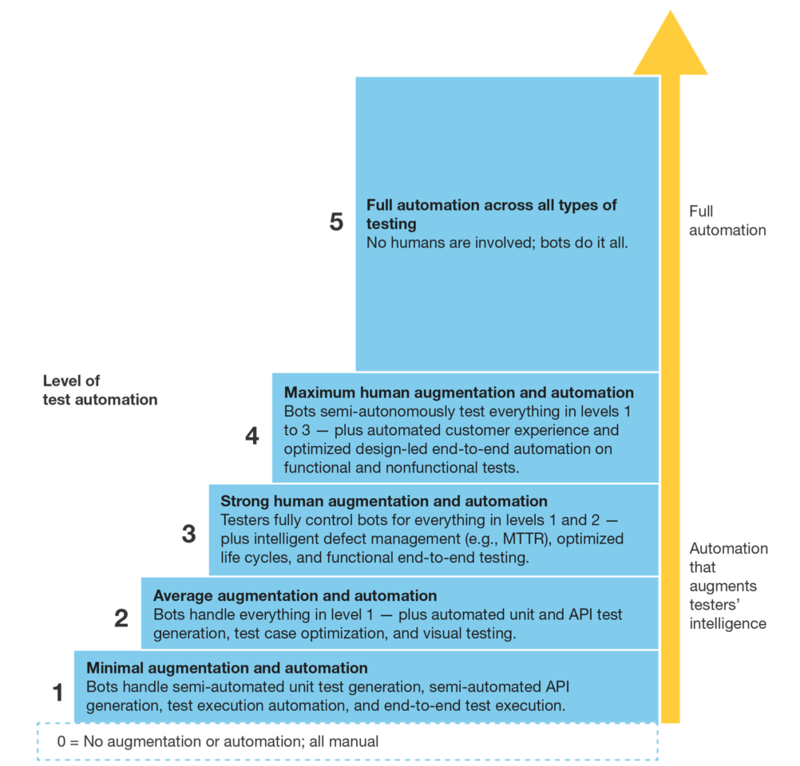 In my report, “The Path To Autonomous Testing: Augment Human Testers First,” I define the path to autonomous testing based on the SAE framework, given its many analogies: 1) We need human testers to assist growing levels of automation; 2) moving from one level of augmentation and automation to the next follows an exponential function curve, making it especially hard to get to the moonshot of level 5; and 3) just as the AI in self-driving cars augments human driving capabilities, the AI and automation in testing augment testers’ intelligence – bringing human business and technical testers back to center stage. So the battle is on: Who will test SW apps and infused AI apps in the future: business testers, technical testers, or development testers? 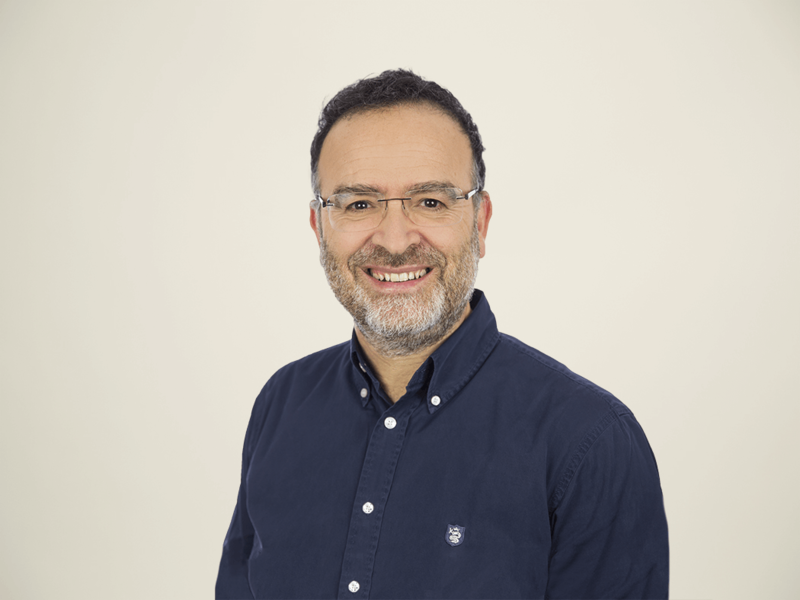 What can AI augment today (in reality) versus tomorrow (still a myth), and how will AI disrupt testing further? If you are a Forrester client, read my report, “The Path To Autonomous Testing: Augment Human Testers,” first to find some answers . . . and then to email me if you have any comments to share or any questions.